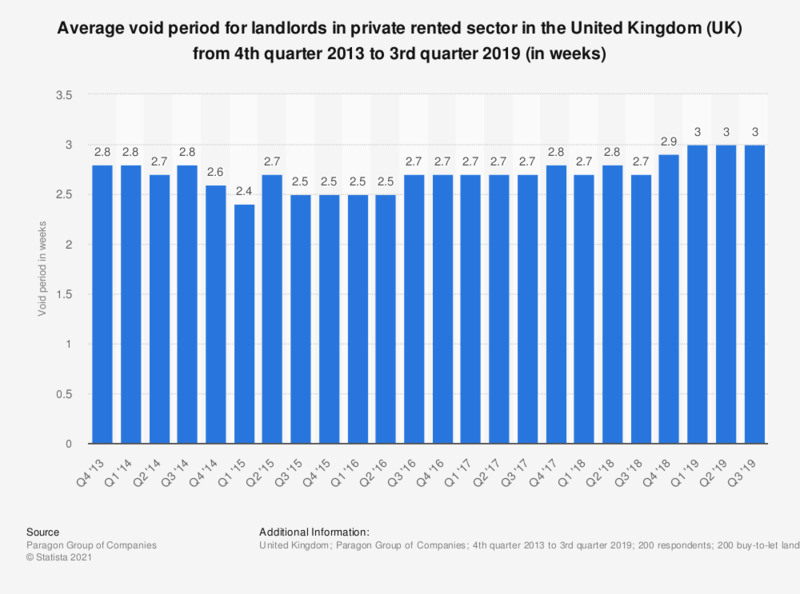 This statistic displays the average tenancy void periods for rental properties in the private rented sector in the United Kingdom (UK) from the fourth quarter of 2013 to the third quarter of 2018. Void periods constitute an important measure for the private rental markets, as they are one of the major reasons for the loss of expected rental income. They require careful planning and budgeting, to keep the time when the property is not bringing the profit to the minimum and to make sure that all necessary expenses are still covered during the void period. As these differ across the cities, towns and regions, researching of the historical data, reflecting the trends of void periods for the local area, is seen as a good way to get an understanding of long-term trends. For all of the United Kingdom, data from end of 2013 till quarter three of 2018 showed that the void periods were shortest as of the first quarter of 2015, counting on average 2.4 weeks. They grew in length to 2.7 weeks in the the last two quarters of 2016 and have stayed at that time length up until the fourth quarter of 2017. As of the third quarter of 2018 the average void period for landlords in the private rented sector amounted to 2.9 weeks, the highest average during the period under display. In the context of property, void period is understood as the time in-between tenant occupation, when the rental property generates no income (but still generates costs).